Respected Kiwi singer and songwriter, Avalanche City (AKA Dave Baxter), returns with his first new album in three years, My Babylon. The new album presents a less folky and more moody Avalanche City than we've heard before. That's probably a result of Baxter setting his guitar aside, opting instead to experiment with his new Juno 106 synth. "Everything I was playing on guitar was sounding the same, I had to do something else to move forward" Baxter explains. While he may have sidestepped his mainstay instruments of ukuleles, banjos and acoustic guitars, the trademark Avalanche City hooks are still in force, even more so thanks to the spaces opened up by Baxter's sonic experimentations. Lead track, Prayed For Love is a statement of intent with its rolling drums, 80s synths and building brass fanfares, Spacey slow-burner Breathe is soaked in vocoder, while Left Behind combines reverb-soaked synth with an infectious, hooky chorus. 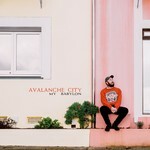 There is a lot to dive into on Avalanche City's new album that we think you'll love. Avalanche City burst onto the scene in 2011 with his breakout hit song 'Love, Love, Love'. It established Baxter as one of the country's most talented songwriters - winning the prestigious Silver Scroll in 2011. Baxter returned as Avalanche City in 2015 with the wonderful We Are For The Wild Places.